New homeowners often want an "instant" tree for shade and privacy and, indeed, there are many trees that will grow quite quickly to a considerable height. But allow enough room for the mature tree to spread out, especially when planted near your house. Also be aware that many fast-growing trees are relatively short-lived and may need to be removed in 30 to 50 years. You'll find that quite a few conifers grow quickly and are well adapted to Washington gardens. These include, of course, the native Douglas fir, red cedar, grand fir and western hemlock. The Douglas fir is most ornamental when grown in full sun, while the others do best with part to full shade when young. Japanese red pine and Japanese black pine both grow quickly to 60 to 100 feet. If you prefer a quick-growing smaller pine, plant the shore pine. also native to the northwest. Deodar cedar is a large tree that needs little water when established. Coast redwood and dawn redwood, on the other hand, do best with regular watering. The southern magnolia grows well in the warmer areas of Washington, and its deliciously scented flowers are an added bonus. For easy care, try the English laurel commonly pruned into hedges, and let it expand into a medium-sized tree. 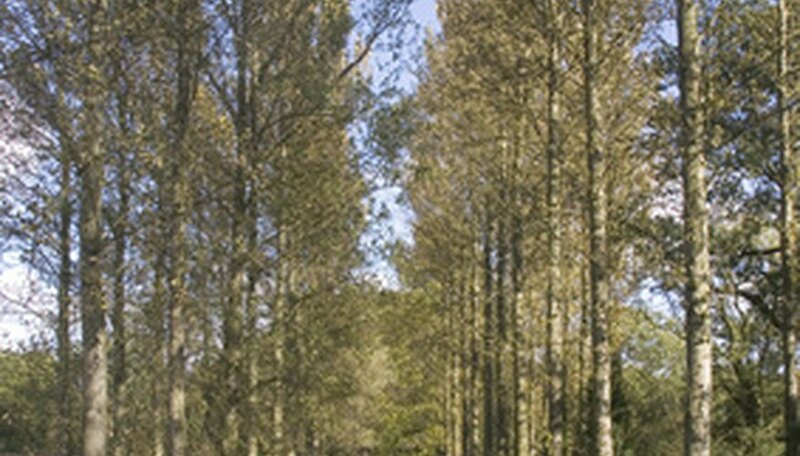 The fastest growing group of trees are the poplars, including the tall, narrow Lombardy poplar. They grow so quickly that they are planted as a bioenergy and fiber crop. If you have soggy soil, consider the pin oak or the weeping willow, a classic waterside tree, but if you want to hold back on the water, try the honey locusts. The tulip tree, Liriodendron, has rather inconspicuous greenish-yellow flowers in spring, but is mainly grown as a shade tree. It likes regular watering. A number of maples are quick growing, including both red and silver maples and the Autumn Blaze maple, a medium-sized tree growing to 50 feet. The Paulownia, or Empress Tree, can grow as much as 5 feet a year, given rich, moist soil, and the clusters of lavender trumpet-shaped flowers are large and eye-catching. For a smaller tree, try the purple-leaf plum, an easy-to-grow tree with cool pink flowers in early spring.